On the third Sunday of each month, we run a volunteer conservation day. Volunteers help cut back overgrown bramble, rhododendron and bamboo, open up new pathways, manage trees and help us with wildlife surveys. We provide a free bus from Bristol and always provide tea, coffee and a hot meal cooked over the fire. By reducing barriers to participation, we can invite a wider range of people into the woods. We need donations to pay for the food, the minibus, admin costs, new tools and work gloves. Tortworth Arboretum is a very special place. It has a long and varied history, but was left to overgrow almost ten years ago and we have been invited to restore the woodland for community use and save it from ruin. For this we rely on volunteers and financial support from a range of passionate, enthusiastic and dedicated people. Our volunteers come from all walks of life, and many see the work that they do at the woodland as a way to learn new skills, and give back to the community. 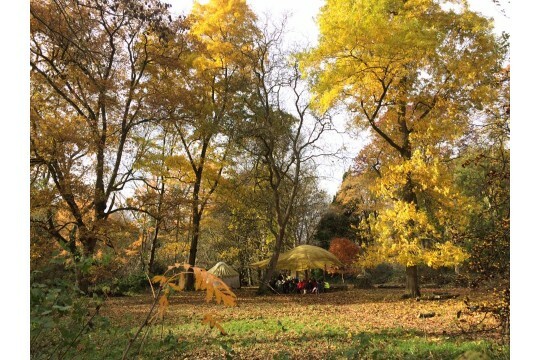 We manage the arboretum for the benefit of people and wildlife, and available for education, conservation and wellbeing programmes, especially for individuals who might not otherwise have access to nature. We are custodians of this incredible heritage; we have a responsibility to look after its historic trees and create a plan for new planting for future generations to enjoy. We believe that spending time in nature is good for you, and will manage the woodland for the benefit of all. As well as our conservation volunteer days we would love some support with fundraising and social media.